This book attacks the often implicit and damaging assumption that ‘everyone’ is online and that ‘everyone’ is using online resources within the specified parameters of employers, government and national laws. Put another way, this book summons a critical Web Studies, asking not only who is using particular applications, but also how and why. This remedial work is required. The concept and label of ‘Web 2.0’ is part of a wide-ranging suite of assumptions that offer simple answers to difficult questions. The term captures a desire for online collaboration and the sharing of information, performed most visibly through blogs, podcasts and wikis. Other ‘products’ that capture the Web 2.0 ideology include Google Maps, Facebook, MySpace and Flickr. Within this framework, websites no long hold information but become a platform to connect applications with users. The business applications have gained the most attention - particularly content syndication  but there are also ‘political’ initiatives overlaying this project including open communication, the sharing of data and the deeplinking of web architecture. Web 2.0 is not only buzzword, but  pivotally for The Revolution Will Not Be Downloaded  increases the online opportunities and applications for those already online while ignoring those still excluded from Web 1.0. This book reveals not only who is using particular online platforms, but the costs to citizenship and democracy through that social profile. Evocative studies of the digitally excluded and downloading communities. 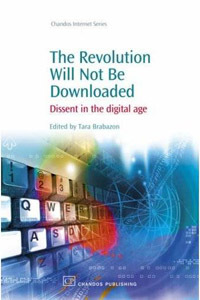 The combination of tracking the digital divide and activating digital dissent makes the book unique in Web 2.0 research. Instead of celebrating Facebook, YouTube and MySpace, there is careful attention to those groups still excluded by Web 1.0. For practitioners, policy makers, teachers, librarians and information professionals, there are methods offered that align theories of teaching and information management with the practice of changing policy. Through such an aim, the book stands alone, and is international in scope and inflection. He who pays the piper must call the tune? Conclusion  what do you do with the other one in a duo? This book can be purchased from Amazon.com, Amazon.co.uk. Please click here for photographs from the launch at University House, at the University of Western Australia, Perth.